Hey! 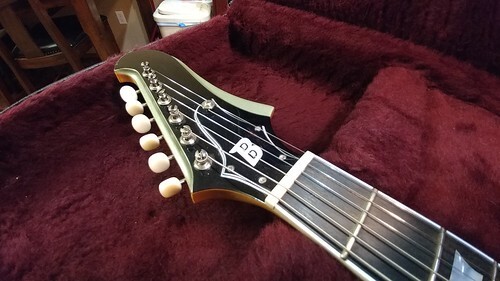 I had been wanting to try a BilT guitar, but didn't really want to custom order one until I knew I liked them and had a chance to try one out. Luck would have it that I was able to do a trade for a cool El Hombre. I have to admit, when I first saw this model I thought it was hideous. The pickguard didn't seem to fit the body well, the body shape was wonky.... but the look grew on me. I love Nels' custom white one. When I saw this one I thought "I want that." It has an interesting history. 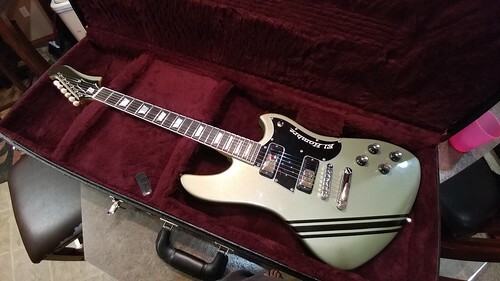 In case you ever need it, here's the full story on the guitar: it was built as a promo guitar (so to very high spec) for Jared Scharff of the SNL band, who is apparently into boutiquey offsets. He played it a few times on air early in 2014 (there's a quick clip of him playing it on his Instagram account). 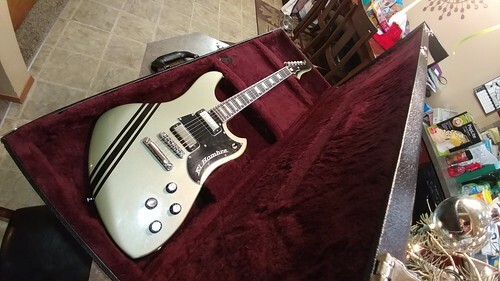 When it came back to Des Moines, a guy from The Nadas (midwest regional band) bought it and had it until it was stolen along with most of the rest of their equipment. It was recovered after the insurance payout, so the insurance company sent it to auction where it was bought by a local car dealership that apparently sells random items to make up for slow winter business. 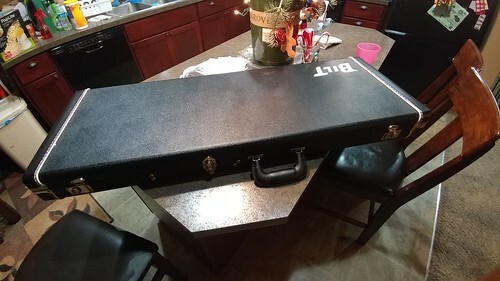 They had it set up by The Lutherie (the shop BilT started from), and I bought it from them and got a new case from BilT. Clip from SNL with it. 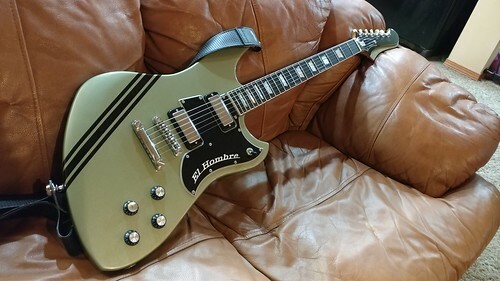 It is a great guitar. I am happy that it is second hand. It has some scratches and such so I don't feel like I have to baby it. The neck feels great. It has a nice shape. Not too big. 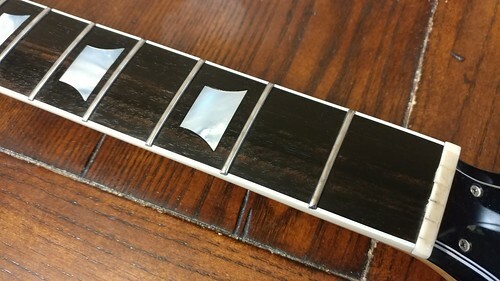 Frets are great and the finish is excellent. 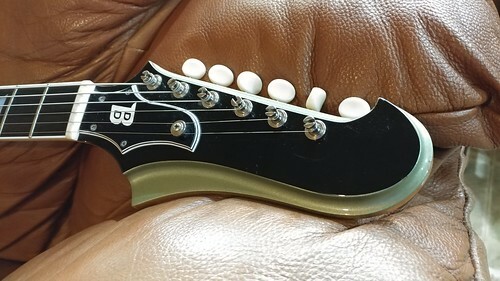 I love the headstock shape and truss cover. The color is actually pretty pale. Sort of ice green metallic. 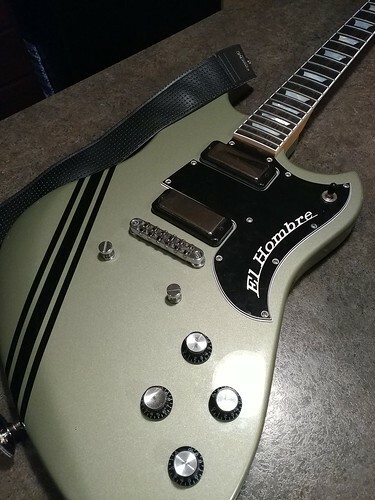 It has Lollar Firebird pickups that are body mounted. (Which I will get more in to after the pics.) The pickups sound excellent. 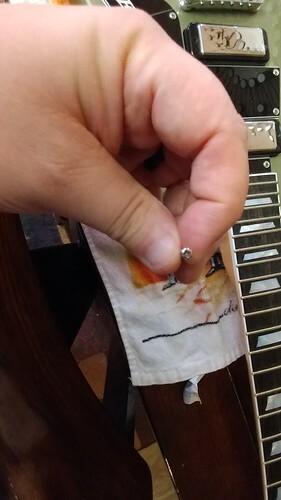 There are push pulls for coil tapping which I forgot to try. Full on they sound great. I heard them described as sounding like single coil pickups, but angrier. The neck pickup does sound kind of single coil like (even though it is hum cancelling), but the bridge is something different. Not sure I can think of a good comparison. It is bright, but not thin at all. I really like it. Pretty simple controls with dual volumes and dual tones. Kluson tuners. The body contour is neat. It goes all across the bottom which is noticeable when you play sitting down. (At least for me, because my arm crosses the body more towards the strap button when sitting, so I do notice the contour there when sitting.) The BilT case is pretty awesome. It is wider than usual because of the body shape and a cool plum color on the inside. Super nice. 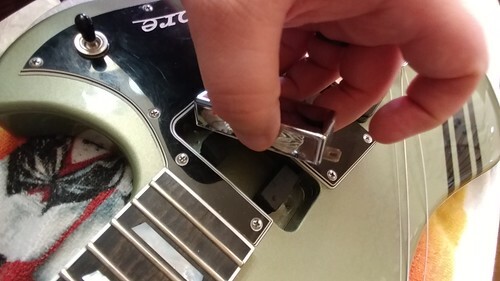 Next up some service work and hopefully some help for anyone else who was like me and unsure how the surface mounted pickups work. I looked online and only found videos with the ones that machine screw mount to the body. The ones on this don't work that way. 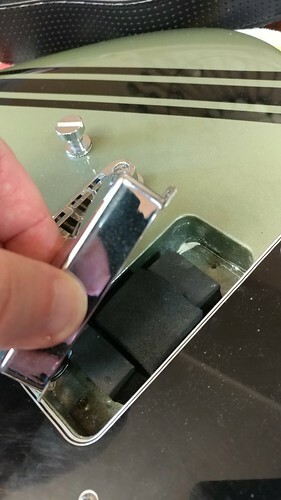 I noticed one of the pickups was sunk in the body a little and when I fiddled with the mounting screws, it was clear they were wood screws, not machine screws. 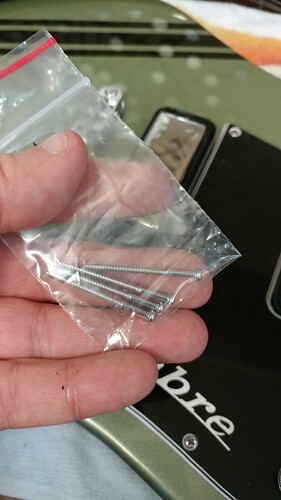 The heads were a little stripped so I figured I should order some new screws just to make sure they don't get stuck in the body stripped. I also figured some new foam would be good since the pickup was sinking too much and not popping up all that well. I figured I would try emailing BilT to confirm what kind of foam and screws I should use and got this reply less than 24 hours after emailing their "info" email. Hi Christopher, we would be happy to send out a new set of screws and foam. Shoot us your shipping address, and we will put some in the mail. So if anyone isn't sure about their service level, there you go. 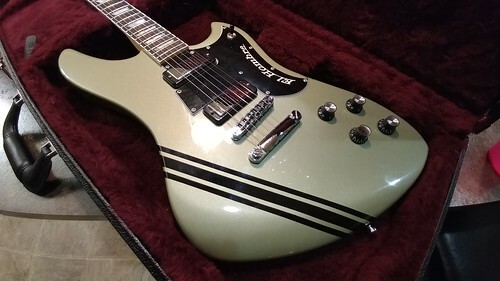 The only company I have had this kind of awesome treatment with other than BilT was Dwarfcraft devices and Couch Guitar Straps who also fixed issues for me for nothing and had excellent customer service. The screws and foam haven't arrived, but I figured I would post pictures of what the cavities look like in case anyone else wondered how the body mounted firebird pickups work. 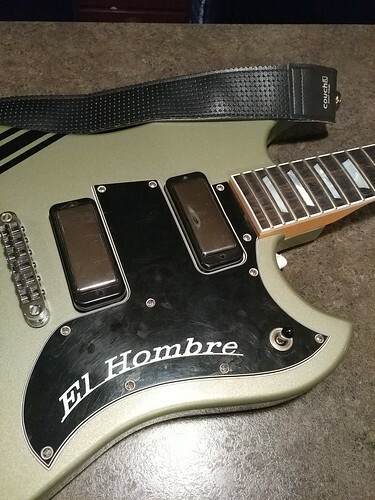 They mount a lot like Jaguar and Jazzy pickups. 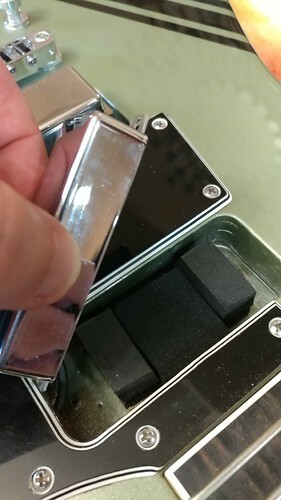 Under the pickup is two foam blocks that press the pickup up and two screws on the left and right screw into the body to lower the pickup. Loosen the screws and the foam pushes them up. Here are pics. Screw heads a little too stripped. 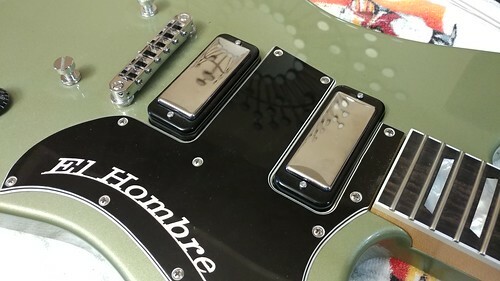 Hopefully if anyone else has issues and isn't sure how the pickups like these work, the pics and details will help. Maybe I will do a youtube video. I couldn't find one other than the Lollar one that talks about the machine screw mounted ones. Jared Scharff of the SNL band. Congrats! I love the story behind it. Now with a VW Couch strap! My BilT care package arrived today! Screws and foam. Was super excited to get the guitar back together. 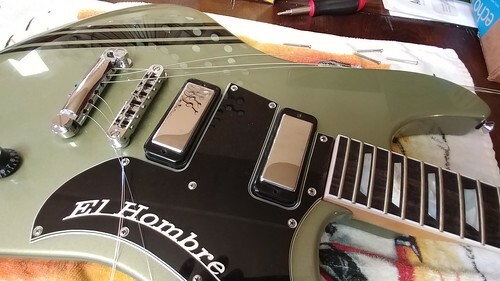 I did do the video on installing the pickups for youtube so now I am out there to the public... LOL Here are the pictures!! This shows the new foam. I took one block and cut it in half so it would fit between the foam already in there. I figured it would give a little extra push. The neck pickup cavity, I trimmed the foam side to side to make it a little shorter since I wanted the neck pickup to sit a bit lower than the bridge. Figured I would clean/oil the fretboard while strings were off. Pretty wood! My video on installing and adjusting Lollar body mounted firebird pickups. Pretty darn slick. Love the history. Have decided I like this guitar wasn't sure on first inspection... t'is an odd looking Beastie. It looks bizarre but is very comfortable playing seated or standing. 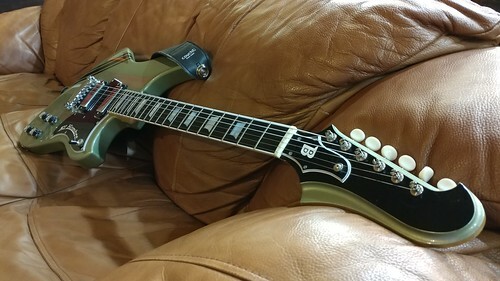 It is a really fun guitar and I think the unique look makes it even a little more fun. That looks really nice. And that backstory is really cool. 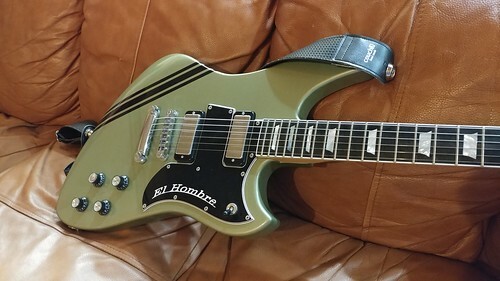 Nice guitar!